This hotel is great for couples and families who want to experience beachfront luxury with the attention of a boutique hotel. This luxury hotel in Guanacaste pushes forward the meaning of comfort and affluence. It is located on Reserva Conchal (Shell Reserve), in the northern area of Costa Rica, about an hour drive away from the Liberia airport. W Costa Rica provides stunning beach views and easy access to a vast array of on-site amenities that cater to different ages and interests. Here you can get pampered at the spa, go golfing or zip lining, and let the kids enjoy their own exclusive games. Although Reserva Conchal has other hotels in the property, W is its own complex, featuring its own vibrant personality and lifestyle. Understated luxury. The W hotel has top-notch facilities and amenities. On-site entertainment. Activities are plentiful for all ages. 24/7 room service. Staff is available for any concern or request during your stay. Resort feel. Although W Costa Rica is a resort, it is designed to preserve the more intimate experience of a boutique hotel. Secluded beaches. The closest beach, Conchal, is very popular among the locals and Reserva Conchal’s guests. The W hotel boasts ultimate luxury, matching the abundant tropical life around it with vibrant colors and wood furnishings. All rooms have the latest entertainment systems and premium WiFi. However, the hotel makes a point of preserving Costa Rican inspired designs throughout, providing a unique aesthetic experience. Although the resort is big and has plenty of space, the feeling it conveys is closer to a boutique hotel. Its attention to detail, personalized attention, and localized flavors combine perfectly to bring up the best of both Costa Rica an the world. To make your stay even more comfortable, the W hotel has 24/7 room service (which they call Whatever/Whenever), so you can have your food cravings met or your questions answered. Parking and access to local phone calls are included with your fee. 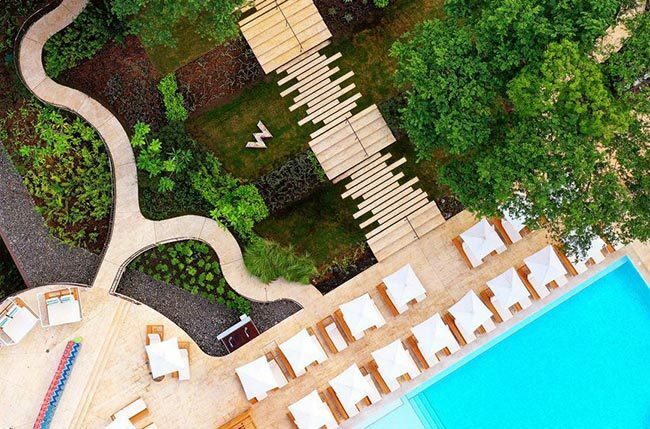 Costa Rica’s natural beauty meets the best of contemporary luxury at the W.The hotel is nestled in Reserva Conchal, a property that contains 96 acres of preserved dry forests, estuaries, and mangrove swamps. There are miles of hiking trails crossing the hills at the property, and over 52 species of wild animals to find. The open balconies in the rooms let not only plenty of light in, but also the views of these impressive wonders. However, the sights don’t stop there. At the front the hotel the trees open to reveal the turquoise waters of the Pacific ocean and Conchal beach. The beach is within easy access of the W hotel as well, and its tame waves and white sand are perfect for swimming and snorkeling. One of the aspects that separates the W from other luxury hotels in Guanacaste is the on-site amenities you can access. Whether you want to have adventures, relax, or enjoy nature, there is something for everyone. As a beachfront construction, the W hotel has plenty to offer for those who love splashing in the water, going on adventures, and kicking back for a well-deserved rest. If you want to explore the outdoors, try to spot all the animals you can while staying here. Coatis, howler monkeys and iguanas are some of the creatures you can see roaming the nearby trees and trails. There’s also chance to go kayaking in the mangroves or the ocean. Swimming, snorkeling, and stand-up paddling are also ideal at the calm beach. There are also several pools at the property, both next to the restaurant and at the beach club. Kick back on one of the deck seats by the main infinity pool, all while sunbathing and relaxing. Admire the endless views of the Pacific ocean and the hills covered in dry forests. To further up your entertainment, hang out at the beach club where you can find another restaurant and a kiddie pool for the little ones to splash and play. If you prefer, they can stay at the game room designed exclusively for them. Peacefulness and mindfulness are also possible here. The Away Spa is a great place to get pampered and forget your worries. If you want to balance your body and mind, take a yoga class at the 24/7 fitness center. For the more adventurous, zip lining is also available in the property. Climb a platform and slide down among the forest canopy in a rush of adrenaline. If you want to enjoy an easy afternoon outside with light exercise, the golf course is also available for a fee. Luxury is not complete without delicious food. W Costa Rica offers some of the best dining in the Guanacaste area, with no less than 6 restaurants and bars where you can grab a bite. The cuisine styles are also diverse, with international dishes influenced by Costa Rican flavors. One of the most exciting options is the Costa Rican-Asian food restaurant, which in addition to dinner offers vibrant alcoholic drinks. Be sure to try one of their remixed rum cocktails, a specialty in their kitchen. The Living Room Bar offers delicious tapas in a relaxed ambiance, with pleasant tunes and views of the ocean. For something more traditional, try some Costa Rican seafood dishes at Latitude 11, which innovates with contemporary twists. If you want to ensure a good experience with your group, head to Zona Azul (Blue Zone). This is the beach club bar and restaurant, which prepares the best comfort food you can try at the hotel. When feeling peckish, head to the Wet Deck, the bar and restaurant next to the pool. Get some quick bites here before going back to your day. And if health is your main concern, there’s the Away Bar, which offers healthy cocktails, drinks, and meals. Don’t miss out on taste while keeping your good habits! Definitely, W is a great luxury hotel in Guanacaste, especially if you are looking for a combination of top notch service, accommodation, and fun that everyone can enjoy. Experience the best of resorts with the personalized touch of W Costa Rica. Contact us if you have any questions, Costa Rican Vacations is glad to help!